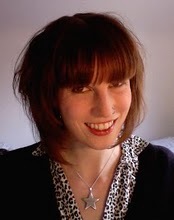 With a number of guest posts in the pipeline Liz Maybury (who featured in May with her Mella Fudge work) popped into my inbox again yesterday so here she is – thanks Liz. This came about via a quick chat with Ed at the Taste Council event in Wicklow which was the first time we had spoken properly and when he happily told me who had done the design for him. 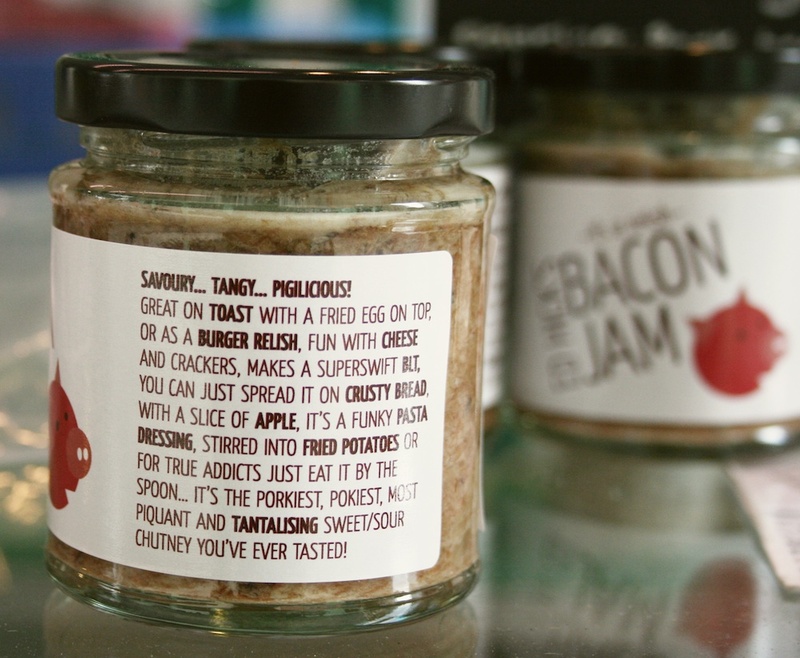 Bacon jam is “the porkiest, pokiest, tangiest, most tantalizing sweet/sour chutney you’ve ever tasted” created by Ed Hick of Hick’s Traditional Pork Butchers in Dun Laoghaire. It can be used as a relish, on eggs, stirred in as a dressing, spread on a sandwich, or even eaten by the spoonful. 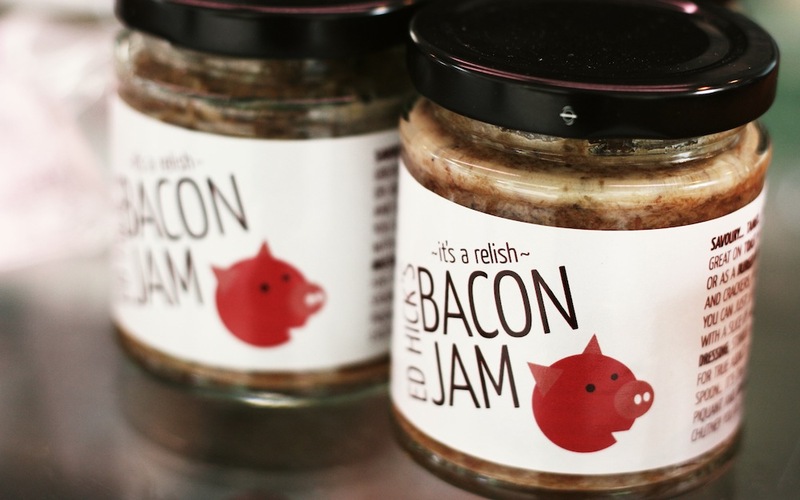 Ed gave me the task of designing a label for his creation, which, being a bacon jam fan, I was only too happy to accept! The brief for the design was fairly open, so I came up with several concepts to present to Ed before we settled on the chosen idea. It wasn’t a requirement to match the label to the existing Hick’s branding, but the little pig illustration alludes to it. I drew the pig using simple geometric shapes. The typography is set at an angle to continue the geometric theme. I chose a soft and friendly typeface as a contrast to ensure that the whole design didn’t look too angular and severe in combination with the capitals of the text and the straight lines of the illustration. The descriptive words in the product information are bold to highlight and bring some points of interest to what would otherwise have been just a large block of text. The size of the label was also important, as if it’s too long it gets difficult to wrap around the jars, so this also had to be considered. 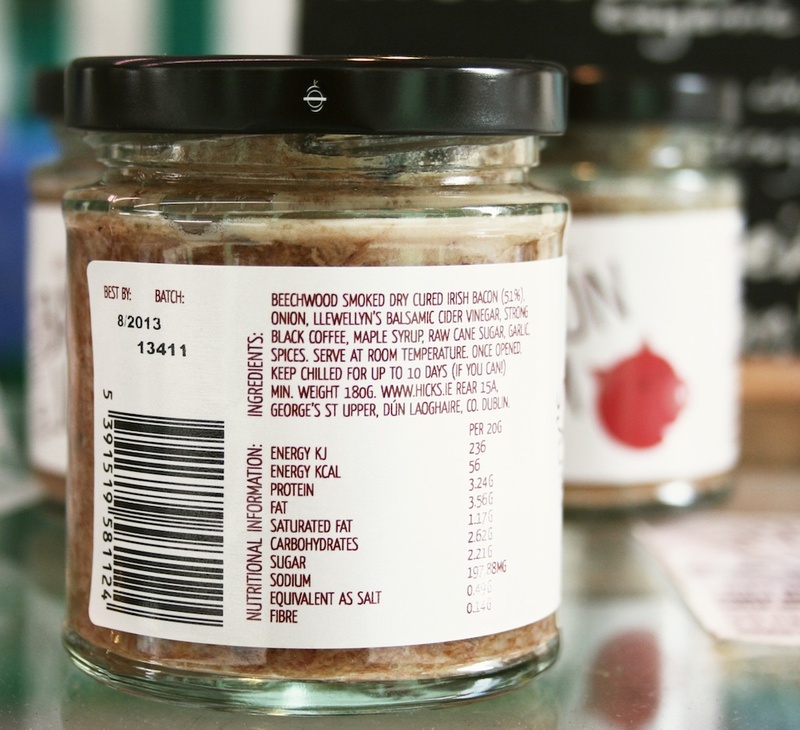 As a result the most challenging aspect was fitting in the nutritional information, ingredients, best before, batch number and barcode into a small area without compromising legibility. I left a space beneath the best before and batch numbers where the information can be overprinted during production, as these figures aren’t constant. The label is self adhesive and printed on a gloss stock. It comes in rolls, which can then be run through another printer to overprint the appropriate best before and batch numbers before they are finally applied to the jars. Bacon Jam is available from Ed at Hick’s stall in Temple Bar Food Market every Saturday and from Sheridan’s Cheesemongers. Thank again Liz. You can see the other posts in this Food Brand Design Guest Post series here.